Earth Scientists Pin Climate Change Squarely On 'Humanity' The federal government's top climate scientists announced Tuesday that 2012 was really hot — among the top 10 hottest years on record and the hottest ever in the U.S., with rising sea levels, less Arctic sea ice and warmer oceans. And the American Geophysical Union called humanity "the major influence" on global climate change. 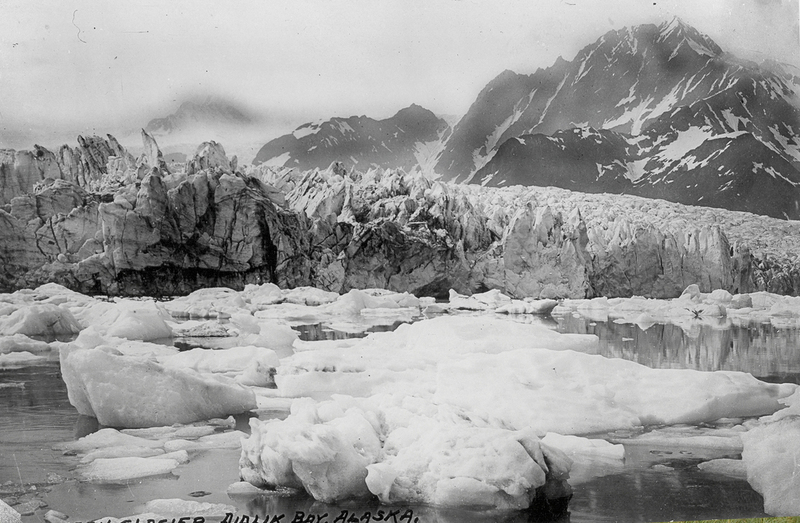 These two photos show the Pedersen Glacier in Alaska's Kenai Mountains in both 1917 and 2005. In the early 20th century, the glacier met the water and calved icebergs into a lake near the bay. By 2005, the glacier had retreated, leaving behind sediment that transformed the lake into a small grassland. The federal government's National Oceanic and Atmospheric Administration issued its annual State of the Climate report Tuesday. Mostly, it was bad news: rising sea levels, less sea ice in the Arctic and warmer oceans. NOAA said 2012 was in the top 10 hottest years on record for global average temperature, but in the U.S. it was the hottest on record. But then there are places that are cooler and wetter, like West Africa. And recently the rise in global temperatures seems to have stalled. 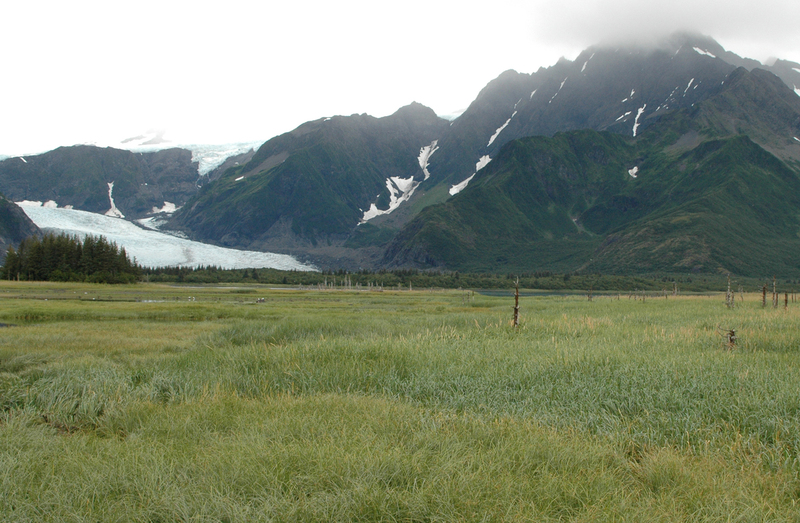 Tom Karl, who runs NOAA's National Climatic Data Center, says the hard thing about measuring climate change is seeing the forest for the trees — a close-up view can be misleading. Take last year's record temperatures in the U.S., for example. "You know, is that just natural variability?" Karl says. "But if you compare that then to the whole suite of indicators that scientists are trying to look at, you see that no, that's part of a pattern we're seeing." NOAA's report describes that warming pattern in 260 pages without discussing the cause; a second report will talk about that in September. But the American Geophysical Union, which represents some 60,000 scientists who study the Earth, is ready with an explanation of the cause now. Arguably, there is no other group of scientists more attuned to what the planet is doing. This week the group issued a two-page statement with the headline: "Humanity is the major influence on the global climate change observed over the past 50 years." It added, "Human-induced climate change requires urgent action." "The scientific evidence is clear: global climate change caused by human activities is occurring now, and it is a growing threat to society. ... In addition to rapidly reducing greenhouse gas emissions, it is essential that we develop strategies to adapt to ongoing changes and make communities more resilient to future changes." "National and international policy discussions should include consideration of the best ways to both adapt to and mitigate climate change. ... At the same time, some continued climate change is inevitable, and policy responses should include adaptation to climate change." "The evidence is incontrovertible: Global warming is occurring. If no mitigating actions are taken, significant disruptions in the Earth's physical and ecological systems, social systems, security and human health are likely to occur." "Climate change is occurring, is very likely caused by human activities, and poses significant risks for a broad range of human and natural systems. ... The environmental, economic, and humanitarian risks of climate change indicate a pressing need for substantial action to limit the magnitude of climate change and to prepare to adapt to its impacts." "[C]omprehensive scientific assessments of our current and potential future climates clearly indicate that climate change is real, largely attributable to emissions from human activities, and potentially a very serious problem. Climate scientist Gerald North from Texas A&M University was chairman of the 14-scientist panel that wrote the statement, the first such statement for the American Geophysical Union in six years. He says scientists are much more confident that their climate models are accurate — there's much more data about the history of the oceans and the atmosphere, and other explanations for the warming planet have been tried and come up short. "We've been looking," he says. "What [are the] other possible candidates? We just cannot find any other way that this can be happening." North agrees that things like temperature and sea level do vary a lot, and that gives the long-term climate record a kind of herky-jerky appearance. So scientists are not surprised at temperature "plateaus" and temporary reversals in sea level rise. "This thing doesn't just go up continuously, but is a kind of ratchet," North says. "It goes up, then it steps back a little bit, then it goes up some more." But the unrelenting driver of the warming — CO2 — does not change. It just keeps coming. The AGU's new statement matches others written by major scientific organizations. But this year it's firmer and more direct. But is this just the scientific community preaching to itself? Amy Clement, a climate scientist at the University of Miami, hopes not. She was on the panel that wrote the new statement. "Let's say I'm in the supermarket," she says, "and I'm in line and people say, 'Oh, what do you do?' I'm a climate scientist. 'Oh, is global warming happening?' And that is so well established in the scientific literature," she says. "And somehow the public still has the perception that that is not well established." Clement says she's not surprised that some people continue to question what most scientists consider to be hard evidence. "You know, that's life. Well, I would say, maybe that's not life. Let's call it politics — that's politics. And it's naive to think that we are not going to be dealing with those issues." Clement points out that the AGU statement acknowledges that there are still uncertainties about the local effects of a warming planet. In fact, it's the continuing uncertainties — about how fast we'll see the effect of a warmer planet and exactly what they will be — that fascinate scientists and guide their new research. But the long-term trend is clear. It's getting warmer.